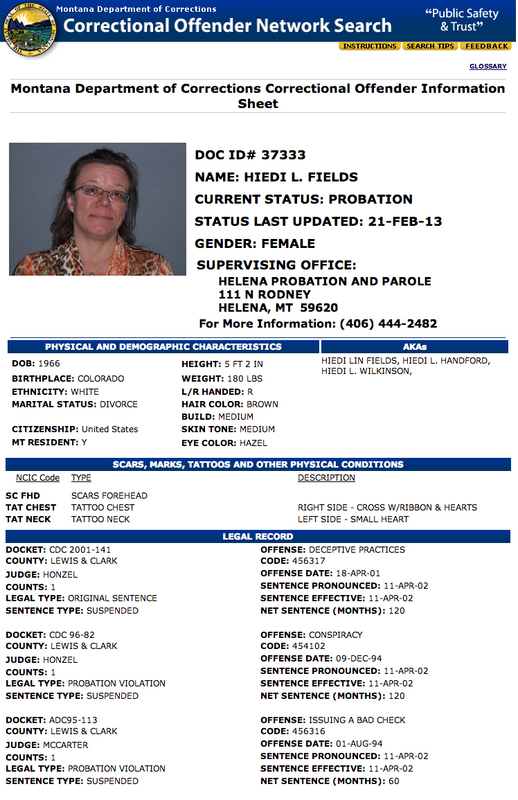 According to Mike Hyde, father of four-year-old Cash Hyde, who passed away last November, the Cash Hyde Foundation has been defrauded by a Hiedi Handford, aka Hiedi Fields, a cannabis activist currently on probation for convictions on numerous felony charges, including deceptive practices. Handford is no longer a registered Montana medical marijuana patient as her probationer status precludes her from legally using marijuana. No word on whether she now uses marijuana illegally, but we have heard Handford now utilizes a “service dog” to relieve her crippling symptoms of carpal tunnel syndrome. Earlier this evening, Mike Hyde posted the following status on his Facebook page. Handford was long-ago ostracized by leading cannabis activists in Montana due to allegations of duplicitous behavior including sales of ad space in issues of her magazine, Montana Connect, that were never published, the long-term and fraudulent use of another activist’s cell phone that she claimed was lost and a host of other allegations. Although Handford’s maniacal social media rants attracted a fair number of devoted followers, posts on Handford’s wall tonight were overwhelmingly angry and disappointed, including “the cannabis community is waiting on an explanation”, “if what was posted about Cashy is true, you should be ashamed of yourself.” ,”You stole in the name of a dead child? How could you Hiedi? Cashy was all about love! How could he be otherwise? He was an angel before he ever made it here. Praying for you. You must need it!” Cashy Hyde captured the hearts of thousands as his valiant battles with cancer were public and his use of medical marijuana well-known. The Hyde family has endured more in the last few years than many of us in a lifetime. My thoughts are with them as they sort out the details of these appalling allegations. Hiedi Handford is the current mistress girlfriend of Irvin Rosenfeld, one of four remaining federal marijuana patients. Requests for comments from Handford received no immediate response. This entry was posted in Marijuana Reform, Montana Medical Marijuana and tagged Cannabis, Cash Hyde Foundation, Hiedi Handford, Irvin Rosenfeld, Mike Hyde, Montana Connect by montanafesto. Bookmark the permalink. I used to be a writer at the joke of a “magazine” called Montana Connect, and I was also screwed out of my salary and had my articles stolen by Heidi. This is also the woman who literally chased legislators through the house of Congress “on our behalf”. Thank you for spreading the word about this cancerous blight on our movement! It’s too bad you don’t need the approval of the cannabis industry before calling yourself a medial marijuana industry advocate, lol! Ha, here’s her response http://mtconnect.me/2013/02/27/i-learned-a-lesson-always-get-a-contract/#comment-316 calling Mike Hyde a liar, and saying its just an issue of “not having a contract”. Maybe if we all ask nice she’ll go away? Perhaps there is a “contract” in Heidis future…. Its a shame whats happened. I feel sorry for the effect it will have on Irv Rosenfeld. She is probably juicing off his name too. Rosenfeld gave her the boot, I hope. She was skimming money while the boy was alive as well! she also scammed medical dispensaries all over the state by selling ads for a non existent magazine called Colorado connect…. I had a job selling ads for the colorado connect magazine and when I saw her promise to deliver a magazine to a dispensary in 3 weeks, I knew she was lying to them! I told her I would not allow her to do this to the cannabis community and I quit and called her out online! a few weeks later she came by my house with a guy she called “Big Mike” and gave me 20 lbs to process into oil and said I could keep half! The next day while I was making oil the cops showed up looking for our Large trashbag of marijuana and wanted to see everyones red cards. We told em they were misinformed and they could search our house if they wanted as long as they had a warrant!. We packed up and moved after they left. needless to say I did not give heidi her share because I knew that there was no way for cops to be at our house looking for something so specific without some sort of tip! I don’t know if it was Heidi or the guy called “Big Mike” who called the cops on us but Mike seemed like a nice guy, being used by Heidi! Heidi Hanford is a sorry excuse for a human being. How the heck do you steal from a dying child and his family? Just remember who Heidi was rolling around with at the Captial, until this story broke. I wonder how many others have given money to Heidi and her co-hort for “lobbying expenses” and other such nonsense. If you gave money, you, too were ripped off, these “activists” are simply living off your donated money, There are no “lobbying expenses” you are siimply paying their living ecpenses, NOT furthing the cause. Heidi Hanford is a sorry excuse for a human being. How the heck do you steal from a dying child and his family? Just remember who Heidi was rolling around with at the Captial, until this story broke. I wonder how many others have given money to Heidi and her co-hort for “lobbying expenses” and other such nonsense. If you gave money, you, too were ripped off, these “activists” are simply living off your donated money, There are no “lobbying expenses” you are siimply paying their living expenses, NOT furthering the cause. I paid 1500.00 for an ad I never got! still got the check stub!! Wow this woman sounds like a real scum sucking loser skank! how sad that people were duped by her. None of us will be surprised when the karma train runs her up side the head someday! It’ll come….surely it will come!